HAPPY THANKSGIVING PARADE NEW YORK CITY! Hello tout le monde! Ca fait un petit moment. Je me demandais comment revenir sur le blog. Aussi impromptu que ma présence à la Parade de Thanksgiving à New York, voici donc le premier article de la saison sur le blog. Il fait très froid ce matin, -7 degrés celsius. 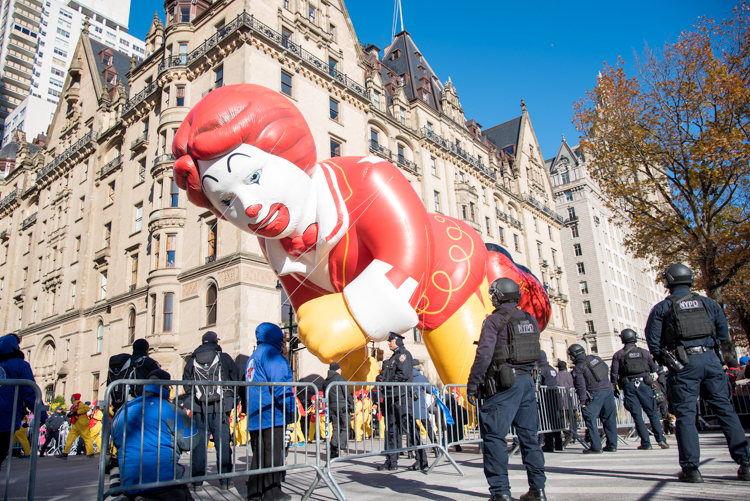 La température la plus froide depuis l’existence de la Macy’s Parade. Ce qui n’a pas empêché petits et grands de se rassembler dans les rues de New York pour assister au spectacle. Comme chaque matin, je me suis promenée à Central Park avec Harrison (et mon appareil photo… just in case). A 9h pile à l’angle de 72nd street et Central Park West, les ballons, fanfares et chars ont commencé à défiler. Première Thanksgiving Parade pour Harrison, la seconde pour moi (souvenez-vous il y a deux ans, mes photos sur la 6ième avenue dans cet article ici). Je vous laisse cliquer sur le lien pour voir toutes les images prises ce matin. Hi everyone! It’s been a minute, right? I was wondering how to make my comeback on the blog. As unexpected as my attendance to this year’s Macy’s Thanksgiving Parade in New York, here I am, back on the blog. It is freezing cold out, think 20 Fahrenheit. I’ve heard this year is the coldest Thanksgiving weather for the parade ever. As scary at it is, nothing can prevent kids and adults to come together in the NYC streets to enjoy the show. This morning started as per usual. I went to Central Park with Harrison (and my camera… just in case) for our early morning walk. At 9AM, we were at the corner of W72nd street and Central Park West. The floats, carts and bands started to walk down Manhattan. It was Harrison’s first Thanksgiving Parade, the second one for me (remember the shots I took down 6th avenue in this post here?). We had a blast – a cold but happy time. Click on the link below to see all the photos taken this morning.